Apparently making up for lost time now, my neighbor Tony sends out word of another autumn ride, this time to the south. I RSVP in the positive once I’ve secured permission from the boss. Our motorcycles maybe thought we’d retired but no, the hiatus is over. 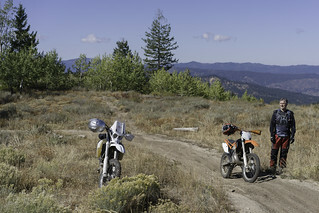 My neighbor Tony and I pull out the bikes to spend a day riding narrow trails through evergreen Idaho mountains. Finally. 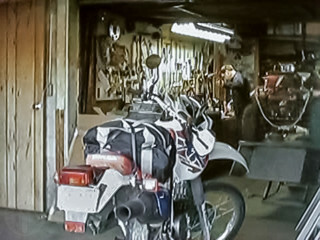 I’ve been telling Kayla’s Polish boyfriend Nick that we’d ride for more than a year now. This may be his last summer in America for a while so it had to happen. 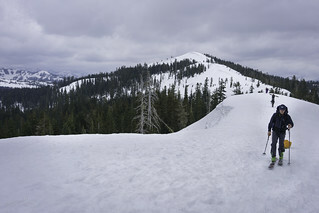 We did the quick, sort of standard loop along the backside of the Boise Ridge, Humpty and Daggett. It was a nice workout. My neighbor and I take advantage of the year’s waning sun to find high desert adventure across the Snake River in the once heavily mined hills around Silver City. An oft expressed intention was finally made real as my neighbor and I got out for a ride together. For a solid five hours, I saw the world without made-up political memes. At first my eyes stung but slowly they adjusted to the lack of hyperbole. I borrow Kayla’s Brazil backpack — cerulean with a yellow silk flower — so I can join a co-worker for a short hike and camp trip somewhere around Stanley. The final mild days of autumn and a new co-worker from Twin Falls, also a photo enthusiast, are occasion to walk the riparian ravine — a green stripe among beige hills — in Boise’s nearby Military Reserve. 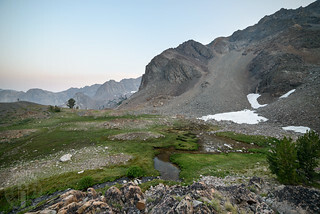 Boulder Basin came to mind when the need for a getaway arose. 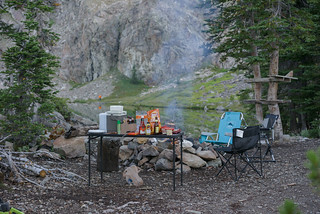 It’s about as far removed from civilization as you can get in an automobile around here, enough of a trip that you’d best plan on spending the night. 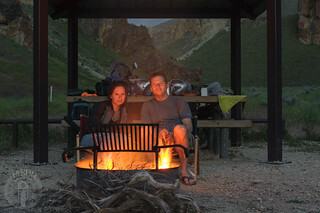 Michael and I ride from Boise through Prairie and across the mountains to Pine and Featherville before turning north to camp around a high mountain lake. 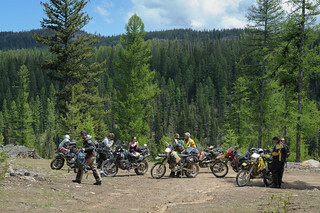 We cover highway, gravel, dirt roads, ATV and singletrack, a real dual sport adventure. 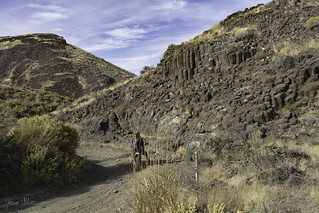 Michael and I ride from Succor Creek Road through the Oregon Owyhees in an eighty mile loop around Three Fingers Butte. Jess and I narrowly avoid fire closures as we make our way north of Ketchum to spend the night high within historic Boulder Basin. The last five miles are quite challenging. They take longer than the first 200. It’s evening when finally we make it to the breathtaking basin. We’ve struggled lately to find a weekend to ride but finally found a little time to head up toward Blacks Creek, along the Oregon Trail byway to Pine, back around Anderson Ranch Reservoir to Pierce then home. It was hot, about 90°F. It felt good to be in the wind. 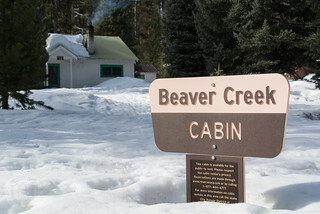 Jessica and I plan a backwoods cabin getaway at the end of a short hike through snow north of Idaho City. It’s only two days after hernia surgery but I figure I can walk slowly. I didn’t anticipate needing to chop wood. 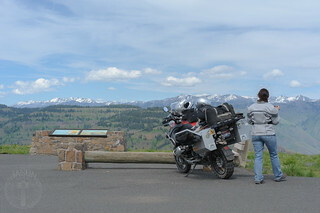 Jessica and I ride over the Boise Ridge, visit the museum in Placerville then have lunch in Garden Valley before attempting to summit Scott Mountain. Snow stops us but the effort means it’s dark by the time we reach Sourdough Lodge where we spend the night. We had been through the heat and it was time to get high as Jessica and I follow the Salmon River to gaze upon the mighty China Wall. 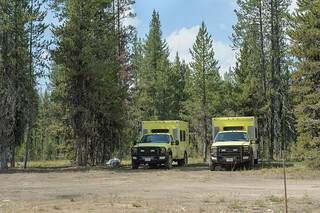 Jessica and I thread our way on the motorcycle along dirt roads by a buzz of wildfire activity on our way to find the next night’s lodging in view of the Sawtooth Mountains. 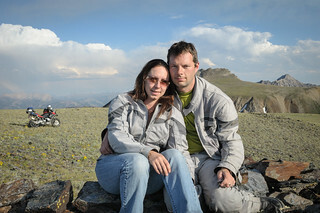 We would see our highest recorded temperature and altitude on the motorcycle during our three days around the Stanley area. When plans to be at the Stanley Stomp Rally didn’t pan out, I thought the Stanley area would still be a nice August destination. Our second and final night at the R.V. park in Enterprise Oregon is equal parts rain and good company. Several rides were planned for Saturday depending on interest and riding style. Jessica and I had made no plans. Finding ourselves stumbling around with coffee cups early in the morning, we fell in with the “Steep and Rocky” crew who were trying to get an early start at a technical route. We were assured we’d probably be fine two-up. Perfect. 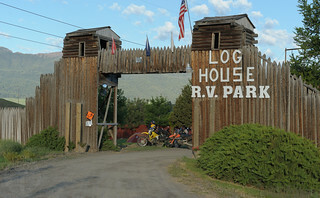 Jessica and I set up house along with fifty other motorcyclers at the R.V. park outside of Enterprise, Oregon. I suppose if you’re a very technical person you might not think Hawai’i can be part of an Idaho Adventure. But through a twist of fate, we did encounter a significant part of Idaho during our time circling the small island of Oahu. 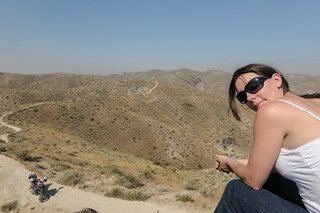 Jessica joins me for the first time in many years to ride forest roads around my new home in Boise. 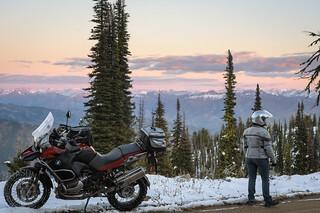 Weather had been unusually nice and my friend Greg Bunce had some business in Boise so, at his prompting, we decided to make it a weekend motorcycle trip from our homes in Moscow, Idaho. I would hang out with my childhood friend Brett, who’d moved there a few years earlier, while Greg was busy. At the time, I worked at the University of Idaho computer store and so had access to demonstration units of some of the first-ever consumer digital cameras, such as the Apple QuickTake and Casio QV-10. I used them quite a bit — so cool to see the photos right on our computer monitors! What we didn’t see comparing our fourteen-inch screens to 4 × 6 prints was just how much quality was lost compared to film. It’s almost tragic but I guess also a bit of history. These were probably shot on the QV-10. 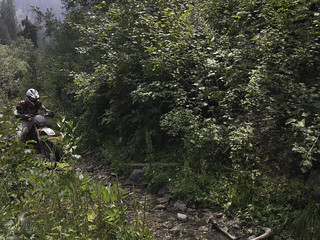 Its images were less than one-tenth of a megapixel (320 × 240).